Nations in which English is an official language (de facto or de jure). Anglosphere countries are those where English is the main native language. The following is a list of territories where English is an official language, that is, a language used in citizen interactions with government officials. As of 2019[update], there are 55 sovereign states and 27 non-sovereign entities where English was an official language. Many country subdivisions have declared English an official language at the local or regional level. 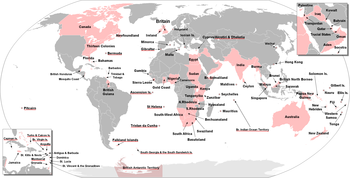 The majority of states where English is an official language are former territories of the British Empire. Notable exceptions include Rwanda, which was formerly a Belgian territory, Cameroon, where only part of national territory were under British mandate, and Liberia, the Philippines, the Federated States of Micronesia, the Marshall Islands, and Palau, which were under American rule. English is the sole official language of the Commonwealth of Nations and the Association of Southeast Asian Nations. English is one of the official languages of the United Nations, the European Union, NAFTA, African Union, Organisation of Islamic Cooperation, Caribbean Community, Union of South American Nations and many other international organisations. Although English is de jure not an official language at the national level in the United States, most states and territories within the United States have English as an official language. Only Puerto Rico uses a language other than English as a primary working language. The United Kingdom, the United States, Australia and New Zealand, where the overwhelming majority of native English speakers reside, do not have English as an official language de jure, but English is considered to be their de facto official language due to its dominant position in these countries. In these country subdivisions, English has de jure official status, but English is not official in their respective countries at the national level. ^1 The population figures are based on the sources in List of countries by population, with information as of 23 January 2009 (UN estimates, et al. ), and refer to the population of the country and not necessarily to the number of inhabitants that speak English in the country in question. ^3 Puerto Rico is, historically and culturally, connected to the Spanish-speaking Caribbean; Spanish is also an official language on the island. Puerto Rico is an unincorporated United States territory referred to as a "Commonwealth"
^14 The Cook Islands and Niue are associated states of New Zealand that lack general recognition. ^ New Zealand Government (21 December 2007). International Covenant on Civil and Political Rights Fifth Periodic Report of the Government of New Zealand (PDF) (Report). p. 89. Archived from the original (PDF) on 24 January 2015. Retrieved 21 April 2015. In addition to the Māori language, New Zealand Sign Language is also an official language of New Zealand. The New Zealand Sign Language Act 2006 permits the use of NZSL in legal proceedings, facilitates competency standards for its interpretation and guides government departments in its promotion and use. English, the medium for teaching and learning in most schools, is a de facto official language by virtue of its widespread use. For these reasons, these three languages have special mention in the New Zealand Curriculum. ^ a b c d e f g h i j k l m n o p q r s t u v w x y z aa ab ac ad ae af ag ah ai aj ak al am an ao ap aq ar as at au av aw Official language; "Field Listing - Languages". The World Factbook. Central Intelligence Agency. Retrieved 2009-01-11. ^ "Society". Government Information Service (Barbados). Archived from the original on 2009-02-13. Retrieved 2009-01-18. ^ a b c d e f g English usage; "Field Listing - Languages". The World Factbook. Central Intelligence Agency. Retrieved 2009-01-11. ^ "English is now official language of Burundi". IWACU English News. 17 July 2014. Retrieved 17 December 2016. ^ "National Profile". Government Information Agency (Guyana). Archived from the original on 2008-08-20. Retrieved 2009-01-18. ^ N. Krishnaswamy; Lalitha Krishnaswamy (6 January 2006). "3.14 English Becomes a Second Language". The story of English in India. Foundation Books. ISBN 978-81-7596-312-2. ^ Malawi Investment Promotion Agency (August 2005). "Opportunities for investment and Trade in Malawi ? the Warm Heart of Africa". Government of Malawi. Archived from the original on 2009-02-25. Retrieved 2009-01-18. ^ "Nauru". New Zealand Ministry of Foreign Affairs and Trade. 2008-12-03. Retrieved 2009-01-18. English and Nauruan are official. ^ "Country profile: Nigeria". BBC News. April 30, 2008. Retrieved November 10, 2008. ^ "General Information on Papua New Guinea". Papua New Guinea Tourism Promotion Authority. Archived from the original on January 31, 2009. Retrieved 2009-01-18. ^ "Country profile: Papua New Guinea". BBC News. 2008-11-28. ^ "Primary Schools". Government of St Christopher (St Kitts) and Nevis. Archived from the original on 2009-01-03. Retrieved 2009-01-18. ^ "St. Vincent and the Grenadines Profile". Agency for Public Information (Saint Vincent and the Grenadines). Archived from the original on 2010-11-12. Retrieved 2011-06-18. ^ "Legislations: List of Acts and Ordinances". The Parliament of Samoa. Archived from the original on October 1, 2006. Retrieved 2009-01-18. Languages for official legislation are Samoan and English. ^ Wong, Aline (2000-11-24). "Education in a Multicultural Setting - The Singapore Experience". Ministry of Education, Government of Singapore. Archived from the original on 2008-05-04. Retrieved 2009-01-18. There are four official languages: English, Chinese, Malay and Tamil. ^ "Statistics Singapore - Latest Data - Population (Mid-Year Estimates)". Statistics Singapore. June 2014. Archived from the original on 5 November 2014. Retrieved 3 November 2014. ^ "Constitution of the Republic of South Africa". Constitutional Court of South Africa. Archived from the original on 2009-01-16. Retrieved 2009-01-11. ^ "The Constitution of Southern Sudan". Southern Sudan Civil Society Initiative. Retrieved 2011-07-09. ^ Kingdom of Tonga (March 2008). "The United Nations / Universal Periodic Review by the United Nations Human Rights Council". Archived from the original on January 25, 2009. Retrieved 2009-01-18. English and Tongan are listed as official. ^ "East Africa Living Encyclopedia". The University of Pennsylvania African Studies Center. ^ "Constitution of the Republic of Vanuatu". Government of the Republic of Vanuatu. 1980. Archived from the original on 2009-01-24. Retrieved 2009-01-18. ^ "Bahrain: Languages". Britannica Online. Retrieved June 7, 2017. ^ "Living in Bahrain". BSB. Archived from the original on June 24, 2012. Retrieved June 7, 2017. ^ English is a "Statutory national working language." Lewis, M. Paul, Gary F. Simons, and Charles D. Fennig (eds.). 2013. "Brunei." Ethnologue: Languages of the World, Seventeenth edition. Dallas, Texas: SIL International. Online edition: [www.ethnologue.com] Accessed 30 March 2014. ^ Under the constitution of 1959, Malay is the official language of Brunei; but English may be used "for all official purposes." Laws are written in English and Malay, with the English version being the authoritative one. "Laws of Brunei: Revised Edition. Section 82" (PDF). 1984. Retrieved 30 March 2014. ^ Ammon, Ulrich; Dittmar, Norbert; Mattheier, Klaus J.; Trudgill, Peter, eds. (2006). "Greece and Cyprus". Sociolinguistics: an international handbook of the science of language and society / Soziolinguistik: ein internationales Handbuch zur Wissenschaft von Sprache und Gesellschaft. Handbooks of linguistics and communication science / Handbucher zur Sprach- und Kommunikationswissenschaft. 3 (2nd ed.). Berlin: Walter de Gruyter. pp. 1881?1889. ^ Spolsky, Bernard (1999). Round Table on Language and Linguistics. Washington, D.C.: Georgetown University Press. pp. 169–70. ISBN 0-87840-132-6. In 1948, the newly independent state of Israel took over the old British regulations that had set English, Arabic, and Hebrew as official languages for Mandatory Palestine but, as mentioned, dropped English from the list. In spite of this, official language use has maintained a de facto role for English, after Hebrew but before Arabic. ^ Bat-Zeev Shyldkrot, Hava (2004). "Part I: Language and Discourse". In Diskin Ravid, Dorit; Bat-Zeev Shyldkrot, Hava (eds.). Perspectives on Language and Development: Essays in Honor of Ruth A. Berman. Kluwer Academic Publishers. p. 90. ISBN 1-4020-7911-7. English is not considered official but it plays a dominant role in the educational and public life of Israeli society. [...] It is the language most widely used in commerce, business, formal papers, academia, and public interactions, public signs, road directions, names of buildings, etc. English behaves 'as if' it were the second and official language in Israel. ^ Shohamy, Elana (2006). Language Policy: Hidden Agendas and New Approaches. Routledge. pp. 72?73. ISBN 0-415-32864-0. In terms of English, there is no connection between the declared policies and statements and de facto practices. While English is not declared anywhere as an official language, the reality is that it has a very high and unique status in Israel. It is the main language of the academy, commerce, business, and the public space. ^ " English, though without official status, is widely spoken throughout the country and is the de facto language of commerce and banking, as well as a co-official status in the education sector; almost all university-level classes are held in English and almost all public schools teach English along with Standard Arabic." de Gruyter, Walter (2006). Sociolinguistics: An International Handbook of the Science of Language and Society. Ulrich Ammon. p. 1921. ISBN 9783110184181. Retrieved June 7, 2017. ^ " English is widely spoken. It is used in business and is a compulsory second language in schools." "Kuwait Guide". Commisceo Global. Retrieved June 7, 2017. ^ "English remains an active second language, and serves as the medium of instruction for maths and sciences in all public schools. Malaysian English, also known as Malaysian Standard English, is a form of English derived from British English. Malaysian English is widely used in business, along with Manglish, which is a colloquial form of English with heavy Malay, Chinese, and Tamil influences. The government discourages the misuse of Malay and has instituted fines for public signs that mix Malay and English." "About Malaysia:Language". My Government: The Government of Malaysia's Official Portal. Archived from the original on 9 November 2013. Retrieved 30 March 2014. ^ "Other languages spoken in Maldives include English, which is also recognized as the second main language. Initially, Dhivehi was used as the medium of teaching in schools, but the need to promote higher education led to the conversion of syllabus in English. Now, English is widely spoken by the locals of Maldives." "Maldives Languages". Retrieved Feb 2, 2017. ^ Baker, Colin; Jones, Sylvia Prys (1998). Encyclopedia of Bilingualism and Bilingual Education. Multilingual Matters. p. 429. ISBN 978-1853593628. ^ English is a "De facto national working language, used in government." Lewis, M. Paul, Gary F. Simons, and Charles D. Fennig (eds.). 2013. "Sri Lanka." Ethnologue: Languages of the World, Seventeenth edition. Dallas, Texas: SIL International. Online edition: [www.ethnologue.com] Accessed 30 March 2014. ^ Under the constitution of 1978, Sinhala and Tamil are the official languages of Sri Lanka, but English is "the link language." Any person is entitled "to receive communications from, and to communicate and transact business with, any official in his official capacity" in English, to receive an English translation of "any official register, record, publication or other document," and "to communicate and transact business in English." English translations must be made for "all laws and subordinate legislation," "all Orders, Proclamations, rules, by-laws, regulations and notifications." "THE CONSTITUTION OF THE DEMOCRATIC SOCIALIST REPUBLIC OF SRI LANKA: Chapter IV". 1978. Archived from the original on 2003-02-03. Retrieved 30 March 2014. ^ Hanani, Fatiha (December 2009). Impact of English on Young Arabs' Use of Arabic in the UAE (Master of Arts thesis). American University of Sharjah. ^ According to Art. 1 para 2. Constitution of Sint Maarten Archived 2013-03-03 at WebCite: "The official languages are Dutch and English"
^ "Associated Countries and External Territories: Tokelau". Commonwealth Secretariat. Archived from the original on 24 March 2014. Retrieved 20 March 2014. ^ a b c d e f g h i j k l m n o p q r s t u v w x y z aa Crawford, James (June 24, 2008). "Language Legislation in the U.S.A." languagepolicy.net. Retrieved April 27, 2011. ^ "Alaska Supreme Court Upholds State's Official English Law". Business Wire. November 5, 2007. Retrieved April 28, 2011. ^ "Arizona makes English official". Washington Times. November 8, 2006. Retrieved April 28, 2011. ^ Slipke, Darla (November 3, 2010). "Oklahoma elections: Republican-backed measures win approval". NewsOK. The Oklahoman. Retrieved April 28, 2011. "Invoeringswet openbare lichamen Bonaire, Sint Eustatius en Saba" (in Dutch). wetten.nl. Retrieved 2012-10-14. ^ "Consulta de la Norma:". alcaldiabogota.gov.co. ^ "Sarawak makes English official language along with BM". themalaymailonline.com. ^ "Sarawak to recognise English as official language besides Bahasa Malaysia". BorneoPost Online - Borneo, Malaysia, Sarawak Daily News. Archived from the original on 2016-03-05. ^ "Sarawak adopts English as official language". thesundaily.my. ^ Scottish Government. "Scottish Facts and Information". Scotland.org. Retrieved March 19, 2014. ^ National Assembly for Wales (2012). "National Assembly for Wales (Official Languages) Act 2012". Legislation.gov.uk. Retrieved March 19, 2014. ^ "West Virginia is the 32nd State to pass Official English". Pro English. March 5, 2016. Retrieved March 28, 2017.